The Voter malayalam movie preview, story and first look posters are given here. The Voter is an upcoming Malayalam movie directed by Priyanandanan and Salim Kumar is the leading actor as 'Gopi'. 'The Voter' is about an election taking place from morning to evening and tells us about the power of a single voter. The article below reveals the details that Suresh Kumar, producer of 'The Voter' revealed to Spider Kerala. ‘The Voter’ is an upcoming movie which is directed by Priyanandanan staring Salim Kumar. The film is produced by Suresh Kumar under the Malavika production and Sathyan Kolangad has written the story and script of this movie. The fact that both director and Salim Kumar are National Award winners adds some glamour to the film. Priyanandanan started his career as an actor in different stage shows and finally chose direction as his profession. He had directed ‘Neythukaran’, ‘Pulijanmam’, Bhakthajanangalude Sredhakku and Sufi paranja Khatha and proved his talents to all the Malayalam film lovers. He won the National Film Award in 2007 for an outstanding direction in his film ‘Pulijanmam’. The Executive Producers of ‘The Voter’ are Murukan. K. Nair and Sanjay, Camera man – Rajeesh Raman, Editor – Manoj Kaannothu, Music by Rajesh Das, Lyrics by Smitha Suresh, Divya Sanjay and Vallachira Ramachandran. Its Production Controller is Thobias. It also eyes to achieve many awards as a lot of talents are involved in it. Suresh Kumar, the producer of the film talks to 'Spider Kerala' about his upcoming project. He shared some hints about its story. The story depicts about an election which is taking place in Thanthonnithuruthu which is a very poor island and the people inhabited there lack their basic facilities which are electricity and water. It shows the pathetic life of such helpless villagers. The story starts when electoral officers and booth agents visit the island to cast the vote of ‘Gopi’. The entire film is based on an election which is taking place in this island in a single day from 7 in the morning to 5 in the evening. Salim plays the role of ‘Gopi’ and he is the only voter in his island. Every year candidates and their parties often promise the voters to provide many facilities but none are kept. So Gopi takes a decision. He decides to teach the power of a single voter in an election to all the politicians and those in power. This made the authorities shocked. The story informs us about the power that a single voter has in an election and how he can make a great change for his society. The film may make history for Malayalam cinema industry as Salim Kumar is now in great touch for this project after his National Award winning performance in ‘Adaminte Makan Abu’. Salim says that it is great to work with such a talented director and is more than happy to do a unique and leading character for him. 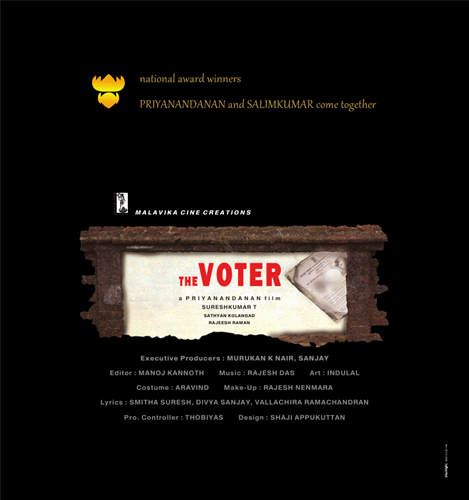 The preproduction works of ‘The Voter’ produced by Priyanandanan is supposed to start rolling in Eranakulam by the end of July.